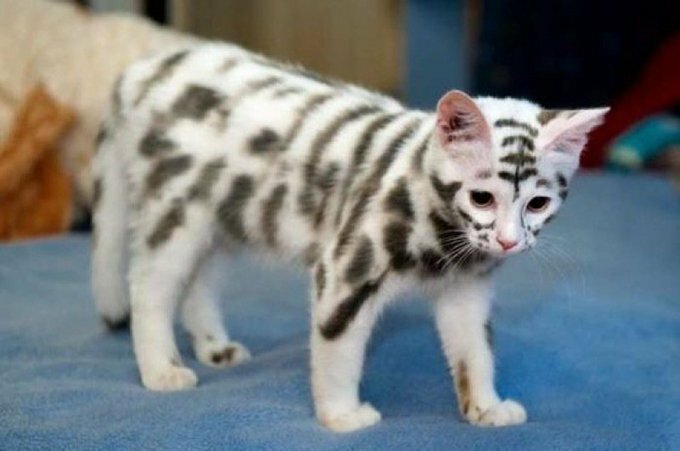 No, this cat is not dyed or Photoshopped. A cat with rare Moscow Mutation: This odd tabby mutation was seen in a semi-feral cat living in Moscow. It appears that the normal banding of the hairs has failed, leaving the tabby markings grey or roan, and leaving the background almost white. Enough photos exist of the cat to rule out digital editing and it does not appear to have been dyed. The tabby pattern itself is unusual and may be due to skin cell mutations or to chimerism. I looked around the Internet and according to Kate on Tumblr, the images first appeared on Russian sites in August of 2015 and it would appear that there are more than one cat with this mutation since the coloring on the cat below is not the same as the one above. I could find very little about the cat or the condition but let’s hope to learn more in the coming months. If you see more pics or find out more information, please share it with us!